Could not find this on their website, but they do not open until May. The very nice people there directed me to their overflow lot on the other side of the Thruway. I parked with the semis but it was free except for a dollar per hour for electric. Good deal. Absolutely beautiful campground with walkways and ponds. However, many sites are tight to get into. I'm in a 42' bus with tow vehicle. Check in said I didn't have to unhook and put me in a 60' plus paved sites. Site was long but narrow to pull into. Had to disconnect tow vehicle in order to maneuver into the site, and still drove over the lawn. Office staff were nice but do not understand the logistics of driving a longer unit. If we had unhooked at check in there would not have been an issue. Many trees here, so satellite reception may be a problem. They also offer shuttle service to casino. Valet said it would be a few minutes...we waited in the cold for 25 minutes, then returned to our site to take our own vehicle...that service could be improved upon! I stayed here on my way home to New England. It's off I90. 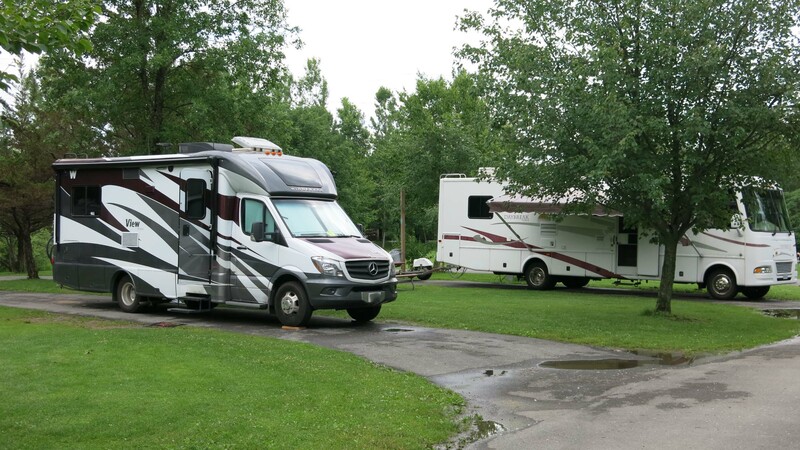 The RV park is about 1.5 miles from the Turning Stone Casino. The RV park is very nice. Sites and roads are all paved. It has full hookup sites. There are bath houses on each loop. It has a nice pool. There is a free shuttle to the casino. I stayed here in Class C motorhome. I would stay here again. Wow this is the way a campground could look like as well. Spotless, clean but still a very good atmosphere. Guessing they got a bigger budget then most but still good price-quality. We stayed here in a truckcamper no reservation ahead. Be sure that you know that they will charge you if you do not cancel within 48 hours. I broke down in ct and called them to indicate that I would not make it and was delayed for 3 days. When I receive my credit card bill, the charge was on it, called and was informed that is was not 48 hours and therefore the charge. Have been going to this campground since it opened, and at least 3 or 4 times a year. Not going to make a reservation but will just show up and if no space there are other campgrounds in that area!